Our surgical group has performed laparoscopic cholecystectomy with a single port since 10 years ago using needles instead of attendance ports. From May to August of 2007, we have used in selected cases (5 cases), magnets for traction of the gallbladder fundus as an alternative for the use of the reins and to improve the aesthetic aspect. 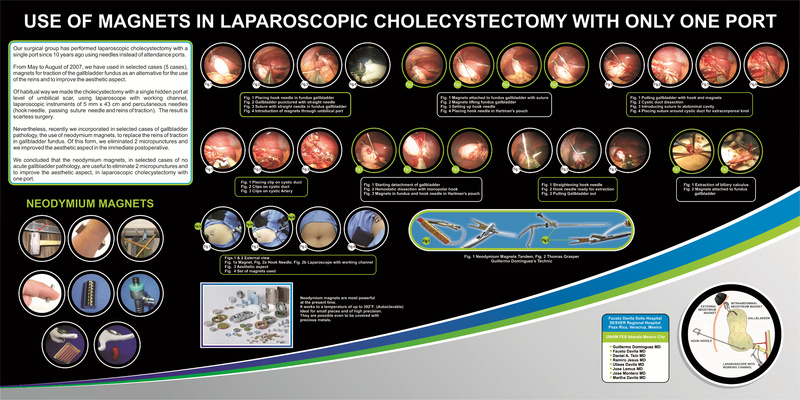 Of habitual way we made the cholecystectomy with a single hidden port at level of umbilical scar, using laparoscope with working channel, laparoscopic instruments of 5 mm x 43 cm and percutaneous needles (hook needle, passing suture needle and reins of traction). The result is surgery without trace. Nevertheless, recently we incorporated in selected cases of gallbladder pathology, the use of neodymium magnets, to replace the reins of traction in gallbladder fundus. Of this form, we eliminated 2 micropunctures and we improved the aesthetic aspect in the immediate postoperative. We concluded that the neodymium magnets, in selected cases of no acute gallbladder pathology, are useful to eliminate 2 micropunctures and to improve the aesthetic aspect, in laparoscopic cholecystectomy with one port.